The perfect introduction to the Harry Potter Colouring Book series. 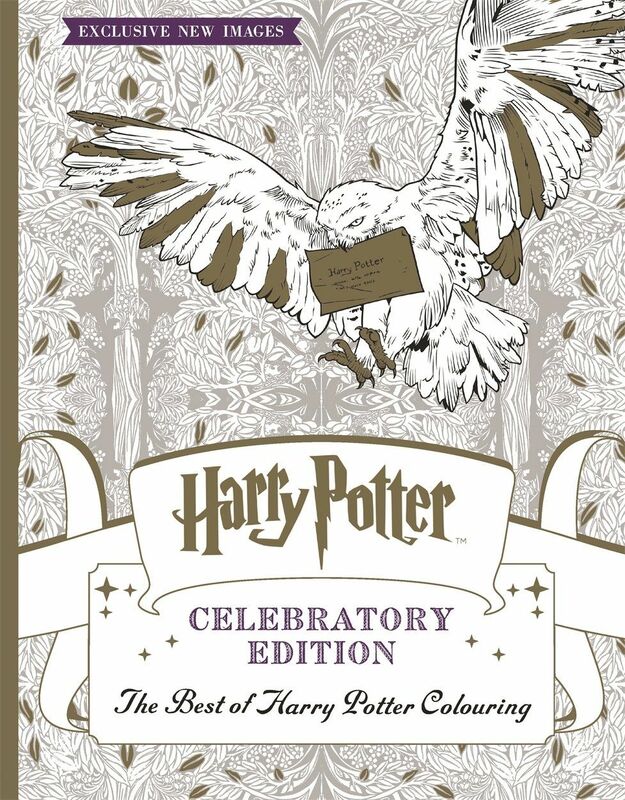 This special Celebratory Edition features a selection of artwork from the Harry Potter Colouring Book, Harry Potter Magical Creatures Colouring Book, and Harry Potter Magical Places & Characters Colouring Book, along with several exclusive never-before-seen images. For best results, we recommend the use of colouring pencils to colour and create your stunning pictures. Vans released a teaser video - their footwear and other products inspired by the four Hogwarts houses: Gryffindor, Slytherin, Ravenclaw and Hufflepuff. Check out the vans website and sign up to be the first to know when the range is released! So I'll start it off by not including Winky! However, we do see her and Dobby very very briefly in The Goblet Of Fire, if you're wondering where? I made a whole topic about 'Things you may have missed in the Harry Potter Films'. Winky, dear old Winky; Crouch's House elf. Important as she is, especially with Crouch Senior to the dark mark cast at the Quidditch Cup in The Goblet of Fire film, plus the whole 'drunk winky' fiasco. Of course lets not forget Horrified Hermione learning that she and the rest of the students are being served by house elves, which prompts her to start (S.P.E.W) Society for Promotion of Elfish Welfare, roping in Harry and Ron to help her. Like this post if you think #Winky should've made it in the film! About Us: Why a Harry Potter Forum/Community? It's 2019! I can hear you now, 'not another website', why should I join? What do I get, what's in it for me, and why have you made the website? I'll admit, I was a late coming to the Harry Potter series. Believe it or not, it wasn't till I saw promo advertising Harry Potter and The Prisoner Of Azkaban at my first job. Now, don't get me wrong I had seen Harry Potter and The Philosophers Stone & Harry Potter and The Chamber of Secrets when they came out on DVD! (Not Bluray). But I didn't like the films, I didn't 'get it'. So after looking through the promo advertising at work, it looked far more interesting, plus the fact that Hermione (Emma Watson) was my age. So after my shift ended I bought the DVD, took it home that evening, setup the DVD and TV, sat down and watched it.... I LOVED IT! From that day forth I've been hooked. Right enough about me, so why the site? I have always wanted to create a website/community and be forum based. I have experiences in the past of running websites and forums, one of the biggest for me was way back in the early 2000s. I had over 4000 members and done reasonably well. It seems the older I get the more and more I get into the Harry Potter Universe. So while over the years I've been learning how to run and host websites, I thought now would be a good a time as any to start a new challenge, albeit 17 years late! While continuing my search I found some used EOL (End of Life) software which are no longer support and could potentially be hacked, putting the members and their site at risk, which to me makes me think the staff put the site in a low priority list. There simply is no excuse for it and something I will not tolerate, nor expect any member to accept. Now while some of the site designs are 6-10+ years old and are great for desktops, these just simply don't work for mobile/tablets devices these days. And this is where I found my niche, provide a platform which is modern, clean and device friendly while incorporating the latest social media's namely: Facebook, Twitter, Instagram and GooglePlus. The Wizarding World | Harry Potter Fan Forums will always use the latest and modern software, my aim is to make it clean, fluid and user friendly. (And that's the biggest part for me to get right, BEING USER FRIENDLY). The more you visit the forums, the more you'll see me ask for advice, opinions, comments and suggestions on how I can make the site better. Be that; Adding an extra forum, extra user groups, etc. I've created a section to have your say, and please do. Make a post, tag me and I'll look into it. Harry Potter: A Pop-Up Guide to Hogwarts - Asda Supermarket - £11 - 50% OFF!! A 3D masterpiece celebrating Harry Potter's Hogwarts School of Witchcraft and Wizardry from New York Times best-selling pop-up engineer Matthew Reinhart. Harry Potter: A Pop-Up Guide to Hogwarts is an exhilarating, interactive guide that transports readers both young and old to a magical place. The castle unfolds in all its glory - you can even open the stained-glass window to peek inside at the iconic dining hall. From the Quidditch pitch to the Forbidden Forest, there is certainly no shortage of places to explore. This is a must-have book for any avid Harry Potter fan! In addition to large pops on each spread, numerous mini-pops will bring to life beloved elements from the Harry Potter films, such as the Marauder's Map and the Flying Ford Anglia. Each pop will include insightful text about Hogwarts as seen in the films, making for a must-have collectible for fans of the Wizarding World. Matthew Reinhart studied industrial design at the Pratt Institute in Brooklyn before finding his calling as a paper engineer. His books include the best-selling Star Wars: A Pop-Up Guide to the Galaxy, A Pop-Up Book of Nursery Rhymes, and DC Super Heroes: The Ultimate Pop-Up Book, among many other award-winning titles. He lives in New York City. You have to see this amazing recreation of the WizardingWorld in Minecraft - Harry Potter in Minecraft! We have been recreating the Harry Potter world block by block for a long time now. Now, we finally release this map by DynamiskFisk, with help from the rest of the team, so that anyone can enjoy visiting their favorite places in the Harry Potter world! The map features locations such as Hogwarts, Hogsmeade, King's Cross Station, Godric's Hollow and much more! Using apparition, as well as the floo network, through the fireplaces, you’ll instantly be able to find any and every part of the Potter universe! Currently only works in Java Minecraft version 1.12 or 1.12.2! We highly recommend downloading the map for 1.12 or 1.12.2, which has more features. Alternatively, you can download a WIP 1.13.2 version of the 1.12.2 map by clicking here. The map is free, although you can choose to donate when downloading.